In high school, Stephen had quit basketball and soccer because they interfered with travel baseball season, part I, and travel baseball season, part II. Strasburg was a fan of the Padres while growing up in the area. He was born in San Diego and pitched for West Hills High in Santee, about 10 miles northeast of the San Diego State University campus. In college, he moved out of his dorm five days into the semester because the noise prevented him from getting a full sleep before morning practice. Though Strasburg had reported to college at 250 pounds, the torture of sweating off the extra weight never prevented him from wanting to. First to show up, first to throw up—that's how it worked during his freshman year conditioning sessions, when he trimmed down to 225. He was a straight arrow in the classroom. Carried a 4.67 grade-point average in high school. Picked up his baseball mitt every day of the year. Never even attended a concert until 2009. "He knows how to close in on a goal," his mother, Kathy Swett, said. When he got to San Diego State as a freshman, pitching coach Rusty Filter told Stephen that pro scouts saw him as a kid who lacked mental toughness and coachablity. "When Coach Filter told me what everybody was saying behind my back, that really pissed me off," Strasburg said. "I was out there to prove them all wrong. To this day, that's kind of a sore spot in my heart. But it's fueled the fire to get me where I am today." Strasburg shed almost 30 pounds his first year at SDSU, developing muscle and tone. And he added 8 mph between his freshman and sophomore seasons, eventually hitting 101 mph. Stephen added Bikram yoga classes to improve his concentration and flexibility. His mom a retired dietitian, taught him how to cook his own healthy burritos. Stephen was 6-foot-4, but weighed 250 pounds and did not wear it well. At times he seemed undisciplined on the mound. 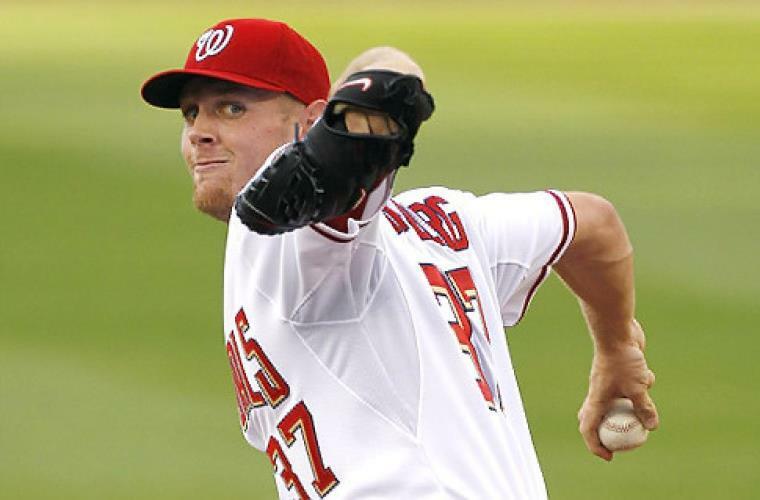 "I was a chubby kid, with a poor mental game out there," Strasburg admitted. He had never lifted weights in his life, and after practice every day went to Estrada's Taco Shop and scarfed down a California burrito, packed with carne asada and french fries. He was so heavy his knees would occasionally buckle while on the mound because they couldn't support his weight. And, he would get upset with teammates when they made mistakes, and he would completely lose his composure on the mound at other times. He would even challenge his coach and the umpires. Pro scouts backed off completely. Although recruited by a number of schools across the country, he enrolled at San Diego State University, where both of his parents attended school. When he first arrived, he was an unlikely candidate to pitch collegiate baseball at all; he was so overweight and out of shape that his conditioning coach nicknamed him "Slothburg" and encouraged him to quit baseball. He also had a difficult time adjusting to college life, moving out of his dormitory and in with his mother after five days. He acknowledged, "I wasn't the most mature guy out of high school. The dorm was an overload, too much, too soon." Strasburg responded. With an intense workout regimen, Strasburg lost 30 pounds in the process. He also worked to improve his mental toughness. Coaches tested him by placing him in high-pressure situations and telling him he needed to get strikeouts. In April 2008, he made news with a 23-strikeout effort in a complete-game one-hit shutout of Utah. In 2008, Stephen went 8-3 with a 1.57 ERA for San Diego State, striking out 133 and only walking 16 in 97 innings. His senior year, Stephen had a 1.68 ERA with 74 strikeouts in 62 innings. He threw 90 mph. On May 8, 2009, Strasburg threw his first career no-hitter (since Little League) while facing an aggressive Air Force lineup at Tony Gwynn Stadium. The Aztecs won, 5-0, in front of a stadium-record crowd of 3,337. Stephen struck out 17 while throwing a fairly economical 116 pitches. He started the game by striking out two of the game's first three batters looking, and he punctuated it by striking out the side in the ninth to end it, throwing down his glove and jumping into his catcher's arms in jubilation. He also struck out the side in the second and the sixth. The only inning he didn't record a strikeout was in the eighth, and he was never really challenged. In August 2008, Strasburg was the only amateur on an Olympic team of professionals. He had already donned the Team USA uniform early in the summer of 2008, starring for the college national team. He was 3-0, 1.33 ERA over 27 innings, striking out 40. The USA won the bronze medal. Strasburg says his favorite athlete is Jake Peavy. In 2010, the Baseball America Prospect Handbook named Strasburg as the #1 prospect in the Nationals organization. Stephen has great makeup both on and off the field. He is low-key and a home body who likes to stay out of the public eye. On January 9, 2010, Strasburg and his wife, the former Rachelle Lackey, were married before several hundred friends and family members at a winery outside San Diego. The couple dated for 18 months before getting married. Stephen and Rachelle had met at "State," as he calls his alma mater. Of her, he says: "We're great together, and we're really excited to start our new life together. I need her by my side as much as she needs me." They honeymooned in Hawaii, on the island of Kauai, and Stephen had his baseball glove in his carry-on luggage. Every other day, he would drive to Kauai High School to throw a bullpen session. The catcher, Lanan Rice-Kashima was a 5-foot-9, 165-pound high school ballplayer whose services had been lined up in advance by Strasburg's agents. At the start of Strasburg's first spring training in February 2010, he was nicknamed Jesus. Why Jesus? "Because what's the first thing you say when you see him pitch?" center fielder Nyjer Morgan said, excited just to answer his own question. "Jeee-sus!" Stephen says his wife is his best friend. Rachel was a water polo player in high school. Early in the 2010 season, they bought a little Yorkie they named Bentley. They are a very normal, down-to-earth couple. Strasburg has a great baseball intellect and aptitude. He won the Silver Slugger Award during the offseason of 2012. Strasburg received his drive and work ethic from his mother, Kathy, a retired dietician who worked at a children's hospital in San Diego. Stephen said it took four people to replace his mother after she left the hospital. Kathy doesn't go to many of Stephen's games, for she is currently taking care of her mother in the San Diego area. "She was never really athletic, but once she puts her mind to something, she will get it done," Strasburg said of his mother. "She is very hard working, very selfless. I definitely think she has the work ethic that she gave to me. That's the biggest thing.… I know what makes me successful. I focus on getting better, bigger, faster, and stronger. That in the long run is going to help me out." Royals ace James Shields was a workout partner during the winter before 2014 spring training. Shields is one of the game's most reliable workhorse pitchers. And he reached out to Stephen, telling him to be mindful of every throw he makes between starts. Where before Strasburg would go straight to the bullpen after a poor outing to work out some mechanical flaw he might have noticed. Shields told him that all of those throws accumulate. He can prevent wear if he just trust his arm and his mechanics. One bad start does not require an overhaul. Now, Strasburg saves his bullets for the game. Stephen and his wife, Rachel, celebrated the birth of their first child in October 2013. It changed the way he thinks about life. "It puts everything in perspective. At the end of the day, it's a game, and you should enjoy it. There is a lot more to life than just baseball. I'm going to enjoy it while I can play it. I'm also looking forward to other things down the road," Stephen said of daughter Raegan. It's hard for Strasburg to believe that he is a father. It seems like yesterday when, at the age of 20, he was selected by the Nationals as the first overall pick in the 2009 draft. "I definitely enjoy [parenthood]. It's fun to come home to," he said during 2014 spring training. When he thinks about his daughter, the burden from super-high expectations melts away, because he places his most intense focus on something other than baseball when he is not at the yard. "I want to go out there and be successful in this game and help this team win," Stephen said. "But that's not my number one priority now. That's being the best dad I can be. It's awesome. It's amazing how that changes your life. Just the little things: she rolls over or she makes a new noise, it's amazing to see. You don't want to miss any of it." Stephen admits how irritated traffic makes him. His wife, Rachel, stays calm even in crisis. "We're very opposite. She's very easy-going. I need structure. The whole routine, starting and everything, it's got to be the same every time. That's where I feel like I'm trying to be willing to adjust, be willing to change a little easier and not get out of whack." Stephen credits his maternal grandmother with helping him develop his baseball skills as a child. She would frequently play catch and even work on pitching with him. He labels her as one of his biggest inspirations. Spring Training 2014: While he leads the effort to help the Nationals reach the postseason, Strasburg is showing a different side in 2014—one that most haven't seen from him. Yes, he's still intense on the mound, but off the field, he is relaxed, more friendly. In the past, media members had to pick their spots when talking to Strasburg, but he has grown comfortable in such situations. Being a first-time father can make one see things differently; Strasburg realizes he has to do more than just throw a baseball. "He ironed some things out this offseason," teammate Ian Desmond said. "He looks like he is less intense, but more focused. It looks like his life is not hanging on every pitch. He looks ready to go." There was a time early in Strasburg's career that he would seem to think too much about his starts, saddling himself with more pressure than necessary. "I can speak about my experiences, and I'm sure it's similar to his," Desmond said. "But you want to become a big leaguer so bad. All you want to do is make it to the big leagues. [Strasburg's] situation is multiplied by 100 because he is in the spotlight from Day 1 in his professional career. But you want to fulfill all the expectations, not only from everyone else, but for yourself." Strasburg now realizes that at times, the ball is not going to bounce his way, and he has his daughter to thank for being able to see the game from a different perspective. Stephen says he learned a whole lot from Tony Gwynn, his coach at San Diego State. "Tony was a great teacher who helped me in ways that are unimaginable," Strasburg said. "He talked to me about how hitters think. It wasn't about mechanics; it was about attacking hitters, and not giving them too much credit. He taught me about focus and concentration and prepared me for professional baseball, as well as how to take care of all phases of my life. He is a tremendous person." On the occasion of Tony Gwynn's death, Strasburg said, "I was a fan first. It just so happens that our lives seemed to intertwine." Strasburg arrived at San Diego State in 2007, and the first time he met with his new teammates and Gwynn—who had just been voted into the Hall of Fame—the baseball legend had a unique message. "One of the first things he said was, 'Yeah, I'm going to the Hall of Fame this year, but I'm just your coach,'" Strasburg said. "There's so many things that I'm never going to forget." Strasburg absorbed much in the art of baseball from Gwynn during his time at San Diego State, and he developed into a No. 1 draft pick for the Nationals in 2009. But when asked to reminisce about the things he learned from Gwynn, Strasburg did not mention any skills particular to the game. The lessons Gwynn instilled in him were much larger than that. "It started with just how to be a man, how to handle the ups and downs, and not everything goes your way in life. I struggled with that," Strasburg said. "He really helped me understand that it's not necessarily the results; it's the work you put in every single day. That's what matters at the end of the day: that you give it everything you've got." Gwynn became family to Strasburg over the years: a mentor, a best friend and a brother. When Strasburg made his Major League debut in June 2010, Gwynn was in the stands sitting next to the pitcher's great uncle, making sure to describe in detail everything that was happening on the mound. "He wasn't going to miss that," Strasburg said. "And I thought it was just such a special experience for my family, specifically, to be there watching it, my debut, with this legend back in San Diego." Strasburg said seeing Gwynn became tough over the past few years, largely because of the Hall of Famer's ongoing battle with salivary gland cancer. Last offseason, Strasburg said he saw Gwynn the least out of any year in which he had been in the Majors. During an interview in 2014, Strasburg was chewing tobacco. Tony Gwynn believed chewing tobacco was the reason he developed salivary gland cancer. Strasburg said he plans to quit chewing tobacco for the sake of his daughter. Strasburg said he started chewing tobacco long before he started playing for Gwynn at San Diego State. Strasburg said he didn't know that Gwynn dipped. "I think it's a disgusting habit, looking back on it," Strasburg said. "I was pretty naive when I started. Just doing it here and there, I didn't think it was going to be such an addiction. Bottom line is, I want to be around for my family. This is something that can affect people the rest of your life. [Chewing tobacco is] so prevalent in this game. It's something we all kind of grew up doing." Strasburg was disappointed that he wasn't able to attend Tony Gwynn's funeral. "I thought there was an outside chance I would be able to fly home and attend the private service that they had," Strasburg said. "There was no possible way. It kind of sucked not being able to be there for it." Gwynn's funeral was held at San Diego State, and Strasburg was happy to hear that so many people attended the service at his alma mater. May 8, 2015: Strasburg will be the first to say that he was spoiled as a child. His mother, Kathy Swett, had a lot to do with that. When Strasburg was a little kid, Swett took notice that her baseball fan son loved Padres great Tony Gwynn in particular. For Strasburg's fourth birthday, Kathy made sure to encourage that. "She got me a poster, a jersey, Tony Gwynn with his face on the wristbands," Strasburg said. "We have this picture at home. It's my mom next to me and it's on my birthday with all my family around me. I'm holding this [Tony Gwynn poster] up and I have this big smile. "It's kind of funny. My mom gave that photo to Tony on his birthday years back. That picture was in his office throughout his coaching career. It sums up what she has done for me." Swett gets emotional when she talks about her only child. It's obvious that Strasburg has returned the favor. "It sounds kind of corny, but he is my heart and soul," Swett said via telephone. "He is my everything." Stephen points out that his mother is a caring person who puts everybody before herself. In fact, she retired from her job in order to take care of her mother. "It was a commitment that she made a while ago," Stephen said. "My grandparents did so much for her. She wanted to make sure when the time came that they couldn't take care of themselves, she was going to help them any way that she could." Strasburg also credits his mother for the stubbornness and determination that he has on the mound. "I go out there and just work as hard as I possibly can," he said. "I owe that to her." Stephen thought about his mentor, Tony Gwynn, when he decided to sign a seven-year, $175 million extension with the Nationals. Gwynn, who was Strasburg's college coach at San Diego State, played his entire Major League career with the Padres. Strasburg wanted to follow in his mentor's footsteps and play for one team -- the Nats. "[Gwynn] was my favorite player [and my] college coach," Strasburg said. "[His staying with the Padres] says a lot about the person that he was. I'm just so thankful to have an opportunity like he did. Strasburg, 27, could have been a free agent after the 2016 season, and he would have been one of the most compelling players on the market. Instead, he opted to remain with the team that selected him No. 1 overall in the 2009 draft. "Talking to my wife and my mom and dad, I think the biggest thing is we tried to see what our life goals are outside of baseball," Strasburg said. "I think this city and this situation gives us a tremendous opportunity and platform to accomplish those things. We're just very excited to be here for some time." According to the Washington Post, Strasburg will get $15 million per season from 2017-2023, in addition to $70 million deferred with no interest from 2024-2030 ($10 million per year). Strasburg could opt out of the contract in three years, which would allow him to become a free agent before his age-31 season. It's the first time the Nationals have given a player an opt-out clause in a contract. The negotiations started during Spring Training 2016, when managing principal owner Ted Lerner called Strasburg's agent, Scott Boras, and said he wanted to do a long-term deal with Strasburg. Both sides had a short window to get a deal done. If a deal hadn't been done within the first month or so of the season, Strasburg likely would have tested the free-agent market. Jan 30, 2018: Strasburg still calls Tony Gwynn "coach." As a San Diego native, Strasburg grew up idolizing Gwynn, and those feelings only grew when he played for Gwynn in college at San Diego State. Strasburg joined MLB Network to share his best memories of his former coach and mentor in advance of the premiere of "Mr. Padre" an hour-long documentary about the late Hall of Famer. "Mr. Padre" premieres and includes interviews with Gwynn's family, friends, former teammates and peers. "I think the biggest thing that I've noticed over the years is all the people that he's touched and that he's impacted," Strasburg said on "Hot Stove". "I think every single person that's in this documentary is going to be pretty special because his impact in the San Diego community is unrivaled." Strasburg shared a special bond with Gwynn, who passed away in 2014 after a four-year battle with cancer. Strasburg said Gwynn was his favorite player as a child and joked that his fandom never wavered even after he realized he would never be as good a hitter as Gwynn. Eventually, Strasburg chose to play college baseball for the San Diego State Aztecs with Gwynn as manager. Gwynn was in attendance, sitting near Strasburg's family, during Strasburg's electric MLB debut in 2010, when he struck out 14 against the Braves. Strasburg's first season at San Diego State was the year Gwynn was inducted into the Baseball Hall of Fame, but Strasburg says that election into Cooperstown did not change Gwynn at all. Aug 11, 2016: It's the experience that sticks with so many who have the opportunity to compete in the Olympics, walking around the Olympic Village and realizing they are among the best athletes in the world. That's what stood out to Stephen Strasburg as he reflected on being a part of the 2008 Olympic Games in Beijing. There he was at 20 years old, having just finished his sophomore year at San Diego State, walking among stars such as Spain's Rafael Nadal or Germany's Dirk Nowitzki, or riding back on the same shuttle bus as Team USA's gold medal-winning volleyball duo of Misty May-Treanor and Kerri Walsh. "That's a pretty neat experience," Strasburg said. "Just little things like that, there's nothing like it." The International Olympic Committee announced Aug. 3 that baseball and softball would be among the five sports added for the Tokyo Games in 2020. Baseball and softball will be returning for the first time since those '08 Olympics in Beijing, when Strasburg won a bronze medal as a member of Team USA. Those games will almost certainly not include talent from Major League Baseball, considering they take place during the MLB season. But Strasburg would be in favor of baseball finding a way to incorporate an Olympic break into the baseball season, similar to the way the National Hockey League does so with the Winter Olympics. "I think if baseball had a way to do it, I think it shouldn't be just all about money, because there's nothing like representing your country in the Olympics," Strasburg said. "The World Baseball Classic is great, but in my personal opinion, I don't think it has anywhere near the same feelings as being out there in the Olympics." Strasburg began that summer of 2008 by pitching for Team USA in the World University Baseball Championship—an international competition for players 23 and younger—when he received a call from USA Baseball president Mike Gaski, asking him to join the Olympic team as well. Strasburg was the only college player selected to the team, which was managed by Davey Johnson, Stephen's future manager with the Nationals. Strasburg described Johnson as the same in 2008 as he was during his three years ('11-13) as the manager in Washington: "easygoing, loose and charismatic." The rest of Team USA's roster featured mostly Minor Leaguers, some of whom eventually made it to the Majors, such as Jake Arrieta, Dexter Fowler, Trevor Cahill and Brett Anderson. Stephen has a solid bond with his wife, Rachel. "My wife has been my foundation," he says. "She's kept me humbled and helped me realize what's important in life. Baseball is just going to pass you by before you know it, so it's important to just enjoy the process and the experience -- even though there are some things you wish you didn't have to go through. "It's all about a growing experience in this game. Getting to go home to her and (Raegan) makes this so much easier to deal with, no matter what happens out there on the field." Strasburg spent a large chunk of his 2016 offseason in D.C. for the first time. He and his wife, Rachel, purchased a house in Virginia and are still in the process of packing up and moving from San Diego. He helped out more during the offseason, but admits now she has been in charge of most of the work while he focuses on baseball. It's a new process for both of them, a change they are welcoming even though both their families live in the San Diego area. Strasburg shocked many across baseball when he decided to sign the extension in May 2016. It had become popular thought that he would head into free agency and end up in California, but he has become comfortable with Washington, and the Strasburgs have found a strong support system. They have come to love Old Town, Alexandria, even though Strasburg described it as pretty much the opposite of where he grew up. They like that the houses are smaller and older and that it feels like a community. The downtown area reminds him of downtown Palo Alto. Rachel often enjoys walking around downtown, taking the dog for a walk or wandering around to find a good restaurant. "Now it feels like home," Strasburg said. "Home on the East Coast." Being in Washington more this offseason also allowed Strasburg to work out at the Nationals' facilities with the club's staff. They tweaked his conditioning and workout routine to use more of his body weight -- pullups, pushups, dips -- instead of increasing weight in the weight room. He combined the workouts with more long distance running along the beach back home in San Diego, something he recalled doing more frequently during and before the 2014 season, the only year he made every start. "He works as hard or harder than anybody I've ever been around," general manager Mike Rizzo said. "And you can tell by the conditioning of the way he stepped into 2017 Spring Training. He was off the charts in every metric that we analyze." It's another part of Strasburg's evolution during the past few years. He might always be an introvert, but those around him say he is more open now than when he first arrived in the Majors. When he is in the clubhouse, he is often laughing and making jokes with the rest of the pitchers. April 24-27, 2017: Stephen went on paternity leave as he and his wife, Rachel, are expecting their second child. "I’m the longest-tenured pitcher in the NL East,” Stephen said early in 2019. MLB.com: As a baseball player, what is the biggest thing you learned about yourself in the last 10 years? Strasburg: I learned how much of a perfectionist I can be. In a sense, it’s a good thing. In another sense, it might not work to my advantage. It’s just being comfortable with what I can provide on a daily basis, and that’s attitude and effort. Those are the things I can control. The mental game is something that is always changing, and it’s always such a huge part of this game. Everybody has ability, everybody has talent. But I think what separates the good ones who might not stick around to the ones who have long careers is their ability to make adjustments and overcome obstacles. MLB.com: The one thing I noticed about you is, you seem a lot more relaxed now than you did when you first came up. What changed? Strasburg: You just see familiar faces year in and year out. You get a chance to know people. For me, I know that it takes a while because I’m a pretty reserved, shy person. I had a chance to play with a lot of great players along the way. I had a chance to learn from a lot of great players and coaches, for that matter. Through those experiences, I kind of realized that it gets to the point where you want to pass down some of the wisdom and knowledge that you acquired. The only way to do that is to continue to build relationships with the younger guys in the clubhouse. That’s kind of where your "legacy" is at. In the baseball circle, when guys ask about other guys, they don’t ask, “Is that guy is a good player?” They ask, “What was he like in the clubhouse?” That’s the respect you get across the league -- the type of teammate that you are. Not the guy that puts up stupid numbers. MLB.com: Jayson Werth and Bryce Harper are no longer on the team. Do you consider yourself one of the leaders of the team? On June 9, 2009: Strasburg was the very first player chosen in the draft, by the Nationals. And just moments before midnight on August 17 the deadline to sign, Stephen agreed to a record-setting $15 million bonus spread over four years, plus incentives. Mark Baca is the scout who signed Strasburg. January 10, 2014: Strasburg and the Nationals avoided arbitration by agreeing to a $3.97 million contract for 2014, plus performance bonuses. January 16, 2015: Stephen and the Nats again avoided arbitration, agreeing to a $7.4 million for 2015. January 15, 2016: The Nats and Strasburg avoided arbitration by agreeing to a one-year contract for $10.4 million. May 9, 2016: Strasburg and the Nationals agreed on a seven-year, $175 million extension. Strasburg is a power pitcher with a 95-103 mph rising four-seam FASTBALL, a 92-95 mph two-seam SINKER he rarely ever uses. Stephen has a fine 82-84mph CURVEBALL, a sweeping 90-92 mph SLIDER, and a solid 88-90 mph CHANGEUP. 2016 Season Pitch Usage: 4-seam Fastball: 56.9% of the time; Sinker only .3% of the time; Change 13.0%; Slider 17.2%; and Curve 12.6% of the time. 2018 Season Pitch Usage: 4-seam Fastball: 44.9% of the time; Sinker 7%; Change 19.9%; Slider 8.6%; and his Curve 19.6% of the time. Average velocity: 4-seam 95.2 mph, Sinker 94.4, Change 88.6, Slider 88.2, and Curve 82.2 mph. He did not use his slider much in '15, but brought it back in 2016, using it about 17 percent of the time, as of the end of June. He is 6 feet 4, broad shoulders but wiry, sharp command, a cold stare, and a fastball so good that it's nearly apocryphal. Strasburg knows how to use every bit of his 6-foor-4 frame. His arm angle is such that, when he comes downhill with that 98 mph-plus fastball, nobody can hit it. At the top of his delivery he turns his left hip slightly toward third base, as if pulling back a bow and arrow, and then unloads with a high three-quarter release. It is very smooth. It just doesn't look like he's throwing as hard as he is. Stephen throws strikes. He has excellent control with all of his pitches, and he also has very advanced command within the strike zone. There are a few baseball people who have concern that Strasburg eventually could break down because he locks out his elbow on his follow through, putting torque on his shoulder. But none of those people would even suggest changing any of his mechanics. In 2014, Stasburg added another weapon to his arsenal—he debuted his new slider during Spring Training. April 6, 2016: Strasburg set a Nationals all-time record (since 2005) for most career strikeouts. He surpassed former teammate Jordan Zimmermann. May 30, 2016: Strasburg also became the first starter in franchise history to win his first nine decisions in a season, one more than Pedro Martinez in 1997. June 4, 2016: Strasburg struck out the 1,000th batter of his career. Strasburg already held the Nationals record for most career strikeouts, and he also became the first pitcher in franchise history to tally all of his 1,000 career strikeouts with Washington (2005-present). The 855 1/3 innings it took for Strasburg to reach the 1,000-strikeout mark is the second fewest in MLB history to Kerry Wood's 853 2/3 innings. July 7, 2016: Strasburg became the first National League starter to begin a season 12-0 since Rube Marquard set the MLB record in 1912, when he started 19-0. July 21, 2016: Stephen recorded his first loss of the 2016 season, losing 6-3 to the Dodgers. Strasburg finished with the second-longest winning streak in D.C. baseball history, behind righthander Firpo Marberry, who won 17 straight between 1930-31. Strasburg became the eighth starting pitcher in baseball history to begin a season at least 13-0 and the first NL pitcher to do so since 1912. May 27, 2017: Strasburg posted a career high 15 strikeouts vs. the Padres. September 5, 2017: Stephen threw six scoreless innings and struck out eight batters in the Nationals' 2-1 win over the Marlins at Marlins Park. Strasburg, who shut out the Marlins, 4-0, on Aug. 30 at Nationals Park, ran his scoreless innings streak to 26, the most since the franchise moved to Washington in 2005. Gio Gonzalez had a stretch of 25 frames without surrendering a run from April 12-29, 2012. 2017 season: By the end of the 2017 season, there was perhaps no more dominant pitcher in all of Major League Baseball than Stephen Strasburg. No one posted a lower ERA than Strasburg's 0.86 mark following the All-Star break, which included a streak of 35 consecutive scoreless innings. He made 28 starts and struck out 204 batters in 175.1 innings with a 2.52 ERA and a 2.72 Fielding Independent Pitching mark. As batters around MLB put up record-setting home run numbers, Strasburg lead the Majors by holding opposing hitters to 0.67 home runs per nine innings. It's not like Strasburg's first half was bad, either, considering he made the NL All-Star team for the third time in his career. But after a three-week stint on the disabled list ended in August, he began his strong run to finish the season. In 10 starts after the break, Strasburg struck out 10.9 batters per nine innings and held opposing batters to a .457 OPS. His scoreless-inning streak was the longest in franchise history and the longest for any pitcher since 2015, according to the Elias Sports Bureau. Best pitch: Stephen Strasburg's changeup. How he uses it: The luxury about Strasburg's changeup is that he can use it whenever he wants. It's most often a lethal put-away pitch. Strasburg is comfortable throwing it inside the strike zone, and it has enough movement to tantalize opposing hitters to chase it out of the zone. He can even start throwing it in the strike zone to use as a pitch to induce weak contact to get ground balls. At the end of April 2018, opposing hitters were hitting .150 against it, with one extra-base hit. What it does: Changeups are effective because of the difference in velocity from their fastball, and Strasburg's changeup still has an average velocity at 88.5 mph in his career, about 7 mph different from his fastball. This changeup has a sharp drop as it nears the plate, which helps him generate swings and misses. What they say about it: "It looks just like his fastball coming out," Nats catcher Matt Wieters said. "I think you kind of look back to Curt Schilling where he'd throw his splitter all the time. It's almost that kind of action, more than a straight changeup would be. Where it comes out looking like a fastball and kind of drops off the table. It is a straight change, but it acts more like a splitter would." September 18, 2018: After giving up a leadoff home run to Peter O'Brien in the second inning, Strasburg hit the next batter before settling down, embarking on a strikeout streak that retired six consecutive Marlins batters. Stephen struck out the side in both the second and third innings, five of those recorded with nasty changeups, before Marlins catcher J.T. Realmuto ended the run with a single to lead off the fourth inning. The Nationals' club record is nine consecutive strikeouts, set by Max Scherzer against the Mets on Oct. 3, 2015. As of the start of the 2019, Strasburg had a career record of: 94-52 with a 3.14 ERA, having allowed 119 home runs and 1,024 hits in 1,229 innings, while striking out 1,444 and walking 335. Stephen is very quick to the plate: 1.1 seconds. So you can't run on him even if you do get on base. But he needs work on his move to first base. It is not very good. So in 2014 spring training camp, Strasburg improved his pickoff move and ability to hold runners. He worked on his slide step and varied his looks toward home plate. Strasburg fields his position well. But he is working to improve at fielding bunts. Stephen is a very good hitter for a pitcher. He gets in a great hitting position and generates a lot of quickness and bat speed. He has the ability to hit the ball to all fields and has occasional pop with that. November 19, 2009: Strasburg suffered a twisted left knee during a workout with the Phoenix Desert Dogs of the Arizona Fall League. He was shagging fly balls. Rest and ice, followed by therapy were all that was needed for the inflammation in the knee. July 22-August 9, 2010: Stephen was on the D.L. with inflammation in his pitching shoulder. August 21, 2010: Strasburg left his start in the 4th inning with a strained flexor tendon in his right forearm, an injury that he had while attending San Diego State University, but pitched through it. He went right back on the D.L. And it was discovered Stephen had suffered a significant tear in his ulnar collateral ligament, requiring Tommy John surgery. June 1, 2013: An MRI confirmed that Strasburg suffered a strained right oblique in his back, on the right side. May 31-June 16, 2013: Strasburg was on the 15-day disabled list with a mild lat strain. October 25, 2013: Strasburg underwent successful arthroscopic surgery to remove bone chips from his right elbow. The cleanup procedure was performed by Dr. Neal ElAttrache in Los Angeles. Strasburg was scheduled to resume his throwing program in four to six weeks and was expected to be ready for spring training. May 29-June 23, 2015: Stephen had to leave a start after only 16 pitches. He had been experiencing tightness in his neck. He was placed on the DL. Doctors confirmed that he has a strained left trapezius muscle. July 5-Aug. 7, 2015: Strasburg was on the D.L. with a strained left oblique. October 2015: Strasburg had surgery to remove a non-cancerous growth from his back. The Nationals had not previously disclosed the procedure. The growth was "muscular" and reported that it lacked "cancerous intentions." Still, it created irritation that Strasburg had to deal with during the season. June 16-July 3, 2016: Strasburg was on the DL with upper back strain. Aug 21-Sept 7, 2016: Strasburg went on the DL with right elbow soreness. September 8-end of 2016 season: Stephen suffered a strained flexor mass in his forearm, leaving his first start off the D.L. So he missed the 2016 playoffs. July 24-Aug 19, 2017: Strasburg was on the DL with right elbow nerve impingement. July 25-Aug 22, 2018: Stephen was on the DL with a pinched nerve in his neck.